This guide is the recommended starting point for veterans and their family members to learn about the process to file a claim for service-connected disability compensation or death benefits with the VA for illnesses/diseases associated with exposure to Agent Orange and other related herbicides during military service. If you've filed a claim in the past, but it was denied after appeals. The VA has an entire section of their website devoted to Agent Orange Exposure. Visit this site for the latest information about recognized diseases/conditions, Thailand bases, Blue Water Navy service, and service outside Vietnam or Korea. In 1978, the VA began a program to examine and to record the names of veterans concerned about health problems related to their exposure to Agent Orange and other herbicides during their military service in SE Asia. Eligible veterans qualify for an Agent Orange Registry exam. This will document the veteran's exposure history, medical history, physical condition and lab test results. This is not the same as a disability claim, but the results can be used to support a subsequent claim. To learn more about this program, click here. VVA encourages all veterans with Vietnam service to have an Agent Orange Registry exam. To get an exam, please contact your local VA Environmental Health Coordinator. In Portland, you can call 503-906-5100, extension 5127 to speak with the local coordinator. You will probably find VA laws, regulations and procedures complicated and frustrating, so it is important to get knowledgeable help to file a claim. Many Veterans Service Organizations, including VVA, offer free assistance to help you present your claim to the VA. You should choose a representative carefully; ask questions about their claims experience before you select them. Find out if there are any limits on their service BEFORE you sign a power of attorney appointing them as your representative. Also, make copies of ALL documents used in your claim and keep them in a safe place in case any paperwork is misplaced or lost. Information on Veterans Service Organizations can be found on the last page of the VVA Self-Help Guide to Service-Connected Disability Compensation for Exposures to Agent Orange. VVA utilizes Service Officers in the representation of claimants seeking VA benefits. Service Officers, referred to as Service Representatives by some organizations, are recognized by the VA as being allowed to represent claimants seeking benefits before the various levels of the VA. To find a list of VVA affiliated Veterans Service Officers near you, visit the VVA website Service Officer Locator page. Jack McManus of Vietnam Veterans of America was part of Operation Ranch Hand during his military service in the Vietnam War. His mission was to spray the herbicide Agent Orange across Vietnam via aircraft. He now works to inform other veterans, their children, and the general public about what Agent Orange was and why the companies that manufactured it need to release more information about how it was made, where it was used and what was in it. This History Channel video offers a summary of the use of herbicides in Vietnam as a military tactic. These defoliants included Agent Orange and similar chemicals. The widespread use of these defoliants some 50 years ago have left an ongoing legacy today. Alan B. Oates gives an audience of veterans and veteran supporters in Silver Spring, Maryland, a look at where the legacy of Agent Orange stands today and what it may still bring to future generations that will be affected by it. Mr. Oates is Chair of the VVA Agent Orange/Dioxin and Other Toxic Exposure Committee as well as Director of Research, Special Projects and Legislative Affairs for U.S. Military Veterans with Parkinson's (USMVP). A surviving spouse married to the veteran at the time of death. An unmarried surviving child under the age of 18 when there is no eligible surviving spouse. A child age 18 years or older who became permanently disabled before reaching age 18 and is permanently unable to support themself. An unmarried child between ages 18 and 23 currently attending a VA-approved school. A surviving parent. Eligibility for parent's DIC is need-based. Survivors filing a claim for dependency and indemnity compensation (DIC), survivor's pension and accrued benefits must complete VA Form 21-524EZ. You are the natural, biological child of a Vietnam veteran. You were born with a birth defect recognized by the VA. At this time, Spina Bifida is the only recognized condition recognized for descendants of male veterans who served in Vietnam. There are additional diseases recognized for descendants of female veterans who served in Vietnam. If a child or grandchild is believed to have a health issue that is linked to a veteran's exposure, it is recommended that a claim be filed for them with the assistance of an accredited Veterans Service Officer (VSO). Expect these claims to be denied; the important thing is to get these descendants registered in the VA system. These claims are filed on VBA Form 21-0304 and are sent to the VA Regional Office in Denver, Colorado. The child or grandchild should also be registered with Birth Defect Research for Children (BDRC) at www. birthdefects.org. The BDRC is an independent, nonprofit organization that has been tracking the health of the children and grandchildren of veterans. Download and read through this VVA publication: Has Your Child or Grandchild's Health Been Affected by Your Military Service? Amy King-Applewhite is the daughter of a Vietnam veteran. All her life, Amy has suffered from severe- and at times shocking- medical issues that she and her father believe were related to his exposure to Agent Orange during the war. Not only has Amy endured numerous painful procedures and surgeries, but her daughters have been born with equally severe medical problems that are often similar to hers. Ken Holybee served his country during the Vietnam War. Today, his three children suffer from rare medical problems that cause them daily hardship and financial stress. Ken and his family want the government to take more responsibility for the herbicides sprayed over Vietnam- and U.S. troops- during the war. Danielle Perry is the daughter of Reuben "Bud" Charles Perry III, who served in the "brown water" Navy along Vietnam's rivers during the Vietnam War. Years later, he suffered from diabetes and peripheral neuropathy. Today, Danielle believes her illnesses and medical conditions were caused by her father's exposure to Agent Orange during his military service. Vietnam Veterans of America Agent Orange Page - The latest news from the Agent Orange/Dioxin and Other Toxic Exposures Committee. 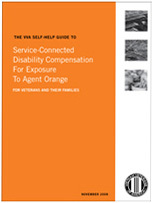 The VVA Self-Help Guide to Service-Connected Disability Compensation for Exposure to Agent Orange - for veterans and their families. VVA Press Release on Blue Water Navy Court Decision: Alfred Procopio, Jr., v. Robert Wilkie: What Does This Mean for You? U.S. Vietnam Veterans and Agent Orange: Understanding the Impact 40 Years Later - A report by the National Organization on Disability, with funding from the Ford Foundation Special Initiative on Agent Orange/Dioxin, June 1, 2009. This is the final and cumulative report of the series published by the National Academy of Sciences, which was asked to perform a comprehensive evaluation of scientific and medical information regarding the health effects of exposure to Agent Orange, other herbicides used in Vietnam, and the various components of those herbicides, including TCDD.